By itself, next year’s cap could prevent 150,000 premature deaths and millions of childhood asthma cases each year, according to research published in the journal Nature. It will also cost tens of billions of dollars for an industry that has dragged its feet on the environment. A.P. Moller-Maersk A/S is considering using a modern version of the old-fashioned sail to help power its ships. The devices, which are being tested on one of Maersk’s giant tankers, look more like huge marble columns than anything you’d expect to see on a traditional yacht. Together, the two 10-story-tall cylinders can harness enough wind to replace 20% of the ship’s fossil fuels, according to Norsepower Oy Ltd., which makes them. Just as carmakers fine-tune the aerodynamics of their vehicles to get better gas mileage, shipbuilders also try to reduce the friction between a vessel’s body and the water. Optimizing hull shape is one strategy. Another, being tried by firms including Samsung Heavy Industries Co. and Mitsubishi Heavy Industries, is streaming bubbles out of tiny holes in a ship’s underbelly, as a lubricant, to help it slice more cleanly through the water. It’s a little like floating on a carpet of air. Samsung says it’s already installing the system on one vessel being built for Mediterranean Shipping Co. and has received two other orders. The tech can cut fuel consumption by 4% or 5%, according to the company. One device, developed by a Japanese startup called Hullbot, looks like a propeller-powered go-kart with nylon brushes and a vacuum on its belly. Thrusters on its back keep it pinned to the vessel’s hull. No divers are needed, but the machine still requires a human operator to guide it by remote control. The challenges faced by electric cars, with their limited driving ranges, are even more daunting when it comes to oceangoing ships, which can weigh 600,000 tons and must often travel thousands of miles. Shipbuilders are experimenting with smaller river vessels and other craft that stay near shore. In Norway, where the government wants two-thirds of all ferries carrying passengers and cars along its Atlantic coast to be electrified by 2030, Kongsberg Gruppen ASA is offering battery-powered ship engines and developing a shorthaul electric container vessel. 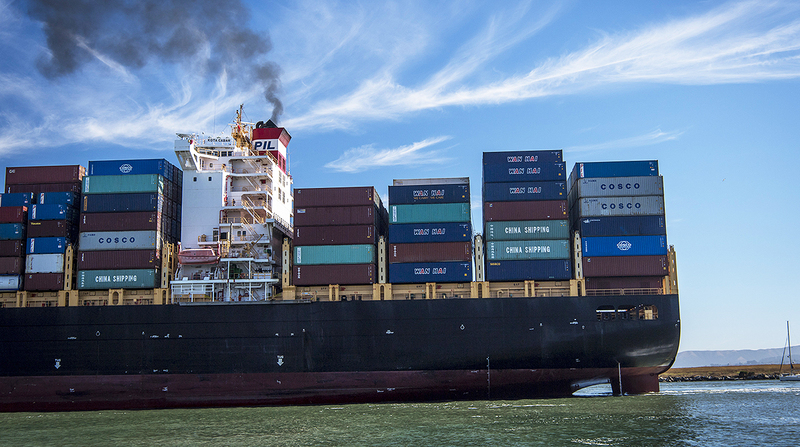 Within the next few years, some 10% to 15% of ships are projected to install scrubber systems, like the ones used on factory chimneys, to capture sulfur and fine particulate emissions before they escape exhaust funnels.